The Paddle Season at the Bay Club is well underway with members in action on both lighted paddle (platform) tennis courts on a daily basis. And once again this year, Racquets Professional Jakob Klaeson provides members with classes and clinics throughout the season. Jakob has worked for several high profile country and tennis clubs in New England, with an excellent track record for adult and junior teaching. 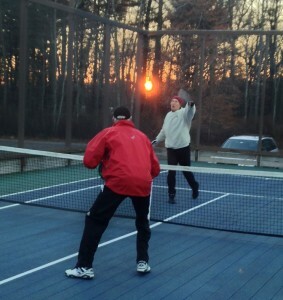 He is PPTA certified and is currently the Head Paddle Professional at the Sakonnet Paddle Tennis club and Head Tennis Professional at Dartmouth Indoor Tennis. The Bay Club at Mattapoisett is a private golf and and residential property located in Southeastern MA. To arrange a private tour please contact Dave Andrews via e-mail or phone, 508-207-9232. The Bay Club welcomed guest lecturer, Mike Bednarski, Ph.D., Stock Assessment Specialist for the Massachusetts Division of Marine Fisheries’ to the club to discuss the natural history of the fishes of Buzzards Bay and their importance to the people of Massachusetts. Coastal waters of Massachusetts are home to a diverse community of aquatic species and provide anglers, divers, and nature lovers with a world class experience. One of the Commonwealth’s most productive regions is the Buzzards Bay Estuary, a dynamic system that hosts a variety of different fish species, ranging from the alewife, an important forage species, to the striped bass, one of the nation’s most valuable recreational species. Members learned about the fish that inhabit the bay as Mike provided an overview on each fish of interest. He also highlighted how the fish community changes throughout the different seasons and the importance of the Division of Marine Fisheries. Mike serves as Massachusetts’ representative to many of the Atlantic States Marine Fisheries Commission’s Technical and the Mid-Atlantic Fisheries Management Council’s Monitoring Committees. Much of his work focuses on understanding the biology and fishery characteristics of many of the Commonwealth’s inshore species including bluefish, summer flounder, scup, and black sea bass. After the talk, members enjoyed a specially prepared dinner including fried scup at the Golf House restaurant.